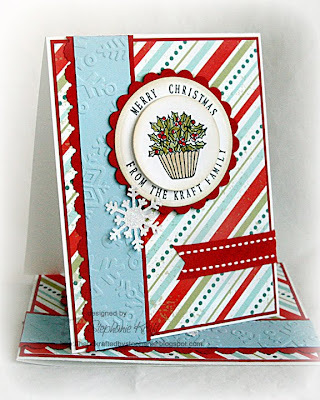 HandKrafted by Stephanie: Wishing You a Very Merry Christmas! Good morning! I'd like to wish you and your families a very Merry Christmas! Since coming home from CA on Monday, I've spent the week finally mailing my Christmas cards and packages, wrapping gifts and finishing up last minute tasks. I even braved Wal-Mart 2 days before Christmas! Now that it is Christmas Day, I can finally relax! I still have to cook Christmas dinner, but we are not hosting any guests, so there is no pressure there! My cards for today (I actually made two of the same) will go into my 2010 Christmas card stash - yea! This one is for Sparkle's 2010 Christmas Card Challenge #3 which is a sketch challenge. I loved her use of blue and red in her sample, so I used similar colors with a little green thrown in as well. I had some of the Lockhart Holly Cupcake images already colored and cut out as well as the JustRite sentiment, so the cards came together fairly quickly. I'm off to spend the day with Dan and Sabrina... I have this post scheduled, so by now she is probably well into her opening her gifts! I hope you have a wonderful day! Thanks so much for stopping by! Accessories: Circle and Scalloped Circle Nestabilities (Spellbinders), Snowflake embossing folder (Provo Craft), Circle punch, Scalloped scallop border punch (EK Success); Snowflake punch (Martha Stewart), Markers (Copic), Ribbon, Foam tape. Very cute card, especially with that personalized sentiment. Hope you guys all had a very Merry Christmas! P.S. I hit Walmart at 7am on my way to work last Monday (I sure love those extended shopping hours). It was the neatest and most well-organized I had ever seen the place! Love these pretty cards! Hope you had a great Christmas, and wishing you a Very Happy New Year! Your card is flat out gorgeous!!! Love it! Such fun and cute cards!